Google's Chromecast Audio is the cheapest, easiest way to stream wireless sound to every room in the house. Update: Added new information about Google’s Home app, new competitors, and more details about multiroom streaming. 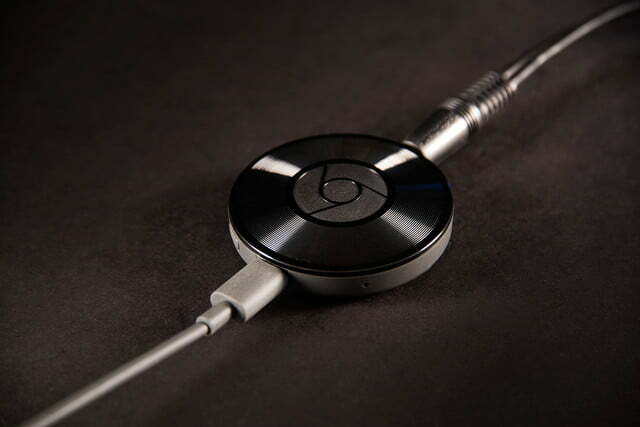 At a special event in September 2015, Google unveiled its second-generation Chromecast streaming device, and along with it, the all-new Chromecast Audio. It’s not often you see an upstart device stand side by side with something as revolutionary as Google’s seminal video streamer, but the Chromecast Audio has been positioned as the keystone for the company’s plans to delve into the world of multiroom audio. Offering whole-home functionality, Chromecast’s signature simplicity, and an affordable $35 price tag, the device is one of the most affordable and intuitive wireless adapters on the market. 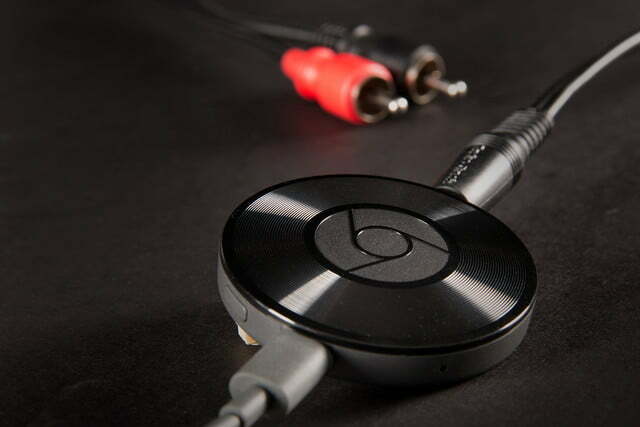 Follow below for our in-depth Chromecast Audio review. Crafted into a sleek black disc with vinyl-style grooves along the top, the Chromecast Audio comes packaged with a power cord and a 5-inch, 3.5-mm audio cable – that’s it. It’s a cute setup, but an audio cable that short and with that particular connection relegates it for use with powered speakers or Bluetooth speakers (maybe one of our favorites?) with an auxiliary input and not much else. 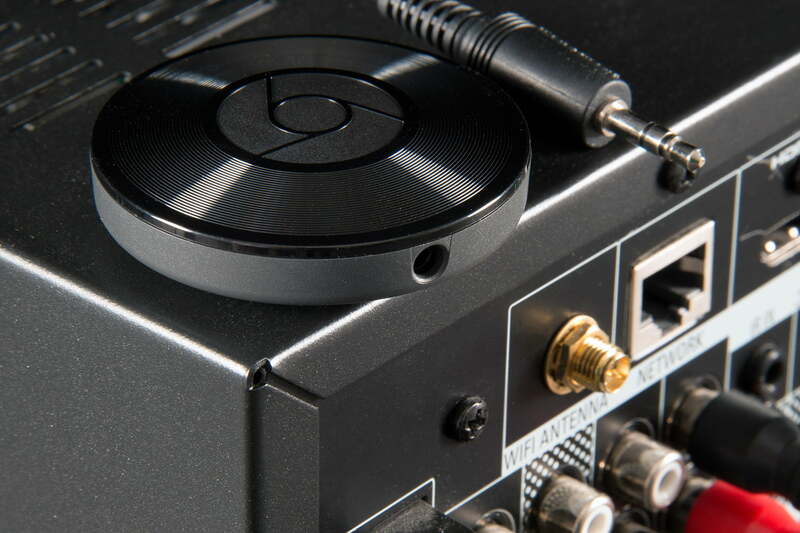 If you want to add the Chromecast Audio to your hi-fi rig, you’ll want to pick up a different cable, such as a 3.5mm to RCA cable, or a 3.5mm to Toslink Optical cable — which is the preferred method for optimal sound. That raises the sticker price from $35 to more like $40-45. Once you’ve got everything wired up and plugged into your speaker or sound system, it’s extremely easy to get going — just like the original Chromecast. After downloading Google’s Home app, you simply add the device as instructed, connect to your local network, fill in your Wi-Fi info, and you’re up and running. One caveat, here: Unless you’re wiring up the Chromecast to the wimpiest of speakers, you’ll want to go into the device settings right away and engage HDR music to lower the compression on your tunes. Once you’re plugged in and online, you have your pick of the same wide selection of audio apps you’d get with the Chromecast for your TV, including Spotify, TuneIn, Rdio, Google Play, and throngs of others. The fact that the app is ready-built for Google’s new addition (thanks to years of app development) gives the Chromecast Audio a nice head start on its predecessor, though it makes purchasing the audio device for a home theater system a bit redundant if you’ve already got a video Chromecast, as it can simply run apps like Spotify through your TV. The biggest draws of the Chromecast Audio include the ability to “cast” without the need for an HDMI port — or even a TV for that matter — as well as the ability to add multiple devices that can all work together over the same app. For those who have an extra hi-fi system here, or a powered speaker there, this allows you to essentially connect all of them over a single app, group them, and/or split them up for Sonos-like control, at a very nice price. Remember, however, that you’ll likely need to budget for cables, even when connecting with a 3.5mm input, since the compatible cable that’s provided is so small. 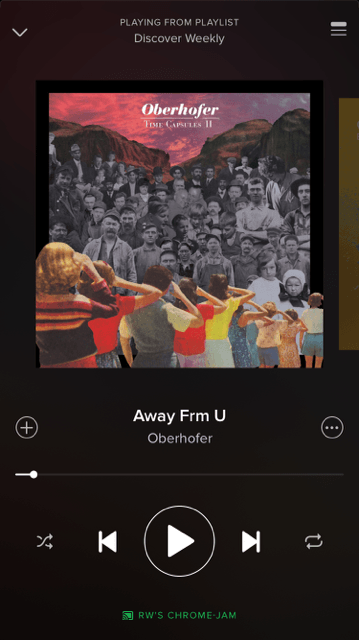 As simplified as the Chromecast Audio is, iOS fans will run into some walls. 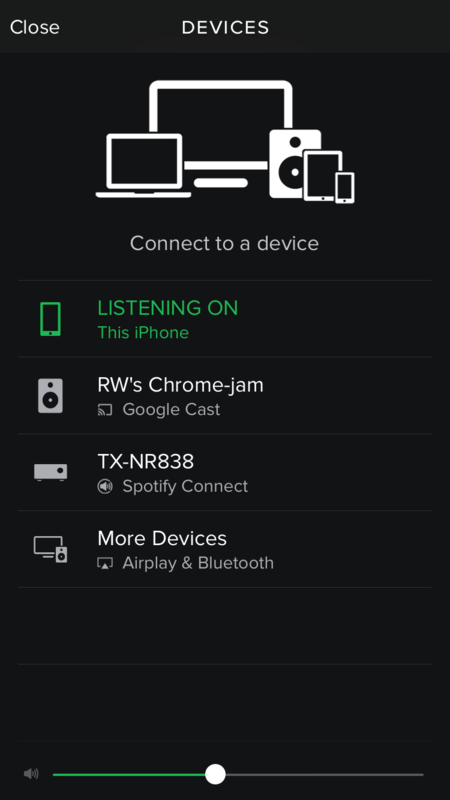 Unlike similar devices that connect speakers over Wi-Fi (or Bluetooth for that matter), the Chromecast Audio can’t stream files directly from your iPhone or iPad when sourced from iTunes or Apple Music. Apple may be at least partially to blame, as the company has long-championed its own wireless streaming system, AirPlay. But regardless of which party is at fault, it’s a bit of a bummer for iPhone users. As you might guess, things are much easier for Androidians, who can use Chromecast mirroring to play any files on a phone or tablet. 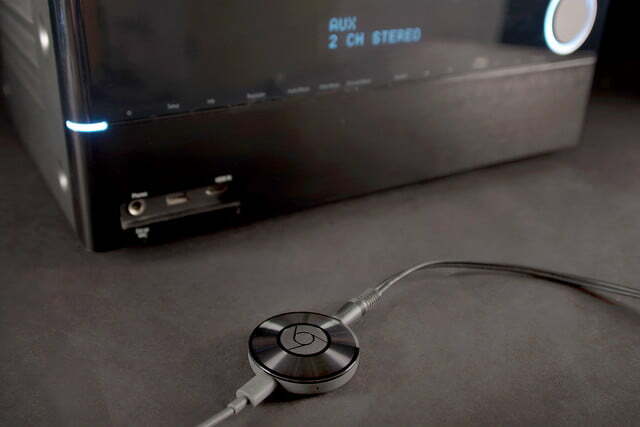 The Chromecast Audio shines brightest by serving up super-stable streaming. In addition, Amazon Prime Music — which comes free with a Prime subscription — won’t stream on the device either. Again, for a Bluetooth device, this simply isn’t an issue. 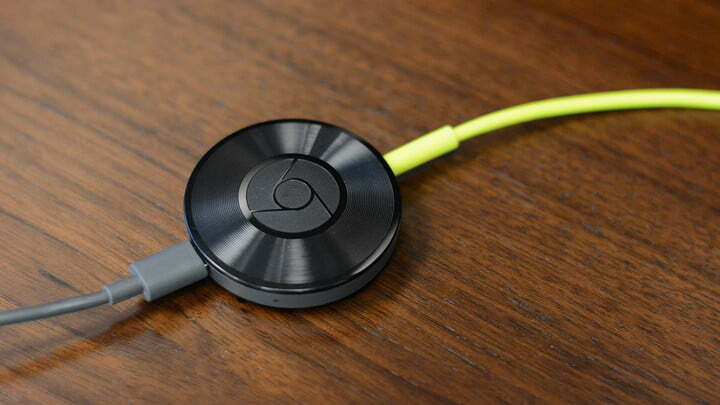 The Chromecast Audio has other limitations, too. You can’t directly stream audio files from a computer, or DLNA storage drive like many wireless music adapters, such as the $60 Muzo Cobblestone, for instance. There is a workaround for Google’s new device through Chromecast-supported server apps such as Plex, which allows you to cast any music files uploaded to your Plex library, but that might be more work than many users are willing to put in — especially considering all the other wireless options out there. 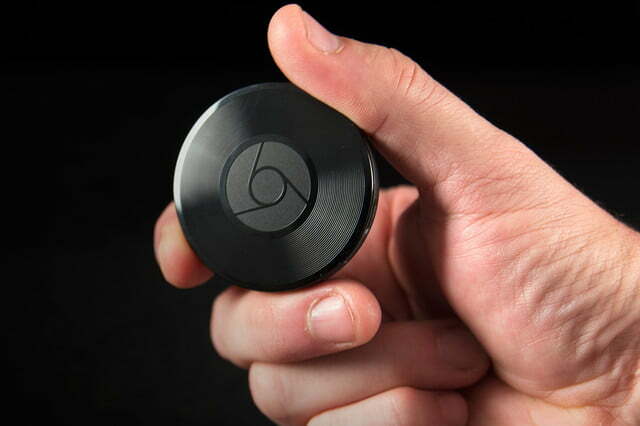 Billed as a hi-fi device, Google has said that the Chromecast Audio is limited to 24bit/48kHz resolution, for now. That’s less than some Wi-Fi streamers (which top out at 24bit/192kHz), though it bests some pricier systems like Sonos, which streams at CD-quality (16bit/44.1kHz) resolution. In any event, a slightly lower sample rate shouldn’t be a problem for most users because: a) it’s a $35 device, and b) it’s essentially designed to stream from music services, the vast majority of which compress audio files well below even CD-quality audio. Users with a large number of hi-res tracks will likely want to find a more refined streaming solution such as a top-tier AV receiver. 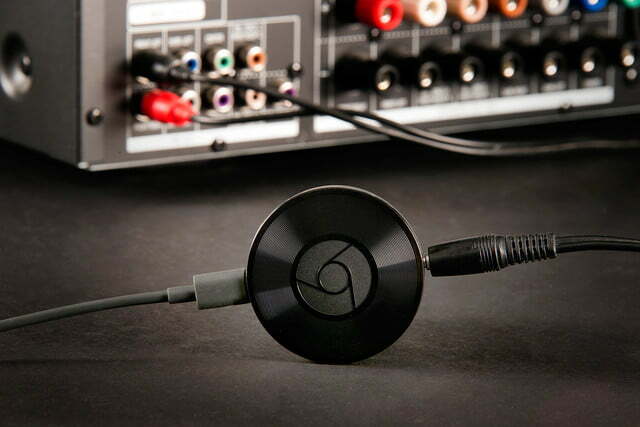 When it comes to serving up brilliantly stable streaming, the Chromecast Audio really shines. Many wireless streamers with homegrown apps – from the Cobblestone mentioned above, to big players like Samsung and Denon – struggle with stuttering on occasion. Not so with the Chromecast. 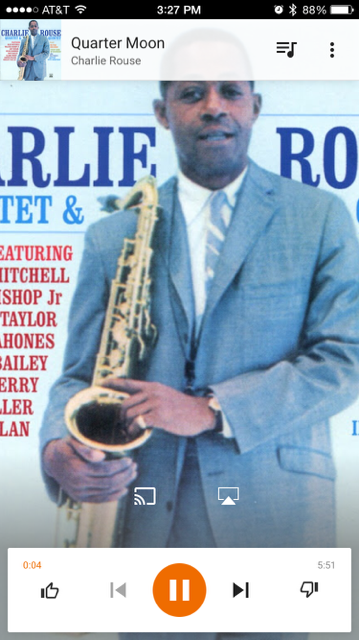 Whether we were casting from Spotify, or tracks from our Plex library, streaming was rock solid. As promised, audio performance is definitely better than what you’ll get from Bluetooth devices, with more detail and better dynamic range that fosters a more intimate listening experience when connected to a quality speaker set. However, when we tested the Chromecast back-to-back with our Cobblestone, we actually heard a bit more clarity and instrumental timbre through the latter device, especially in the upper register. In comparison, cymbals and other percussive instruments sound a bit smoothed over with the Chromecast Audio, though both devices do a pretty impressive job for their price points. 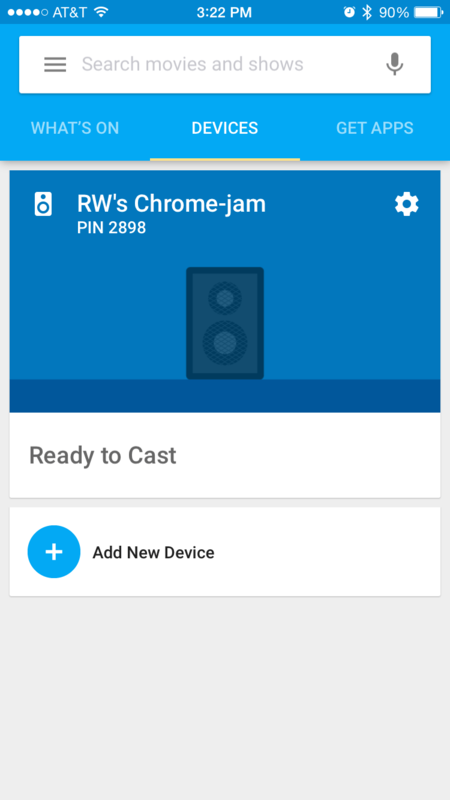 While there’s no shortage of competition in the wireless streaming marketplace, the Chromecast Audio is among the simplest, cheapest, and most convenient ways to make virtually any audio device in your home wireless, while linking a few together can bring multiroom audio to your home for a pittance. Made of fairly light plastic, this isn’t the kind of device you expect to stand as a seminal home theater component. On the other hand, our original video-streaming Chromecast is pushing 3 years old, and hasn’t skipped a beat. 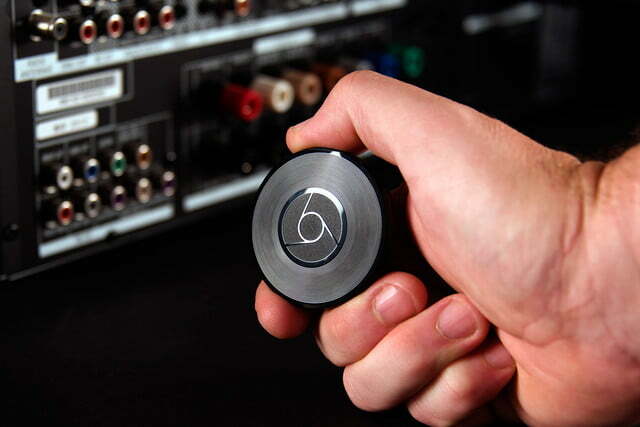 With proper care, there’s no reason the Chromecast Audio shouldn’t last for years to come. While there are plenty of pricier wireless speaker systems like Sonos, DTS Play-Fi speakers, and multiple other speaker choices, the first thing that comes to mind is the Muso Cobblestone we mentioned above. There are also tons of Bluetooth devices that will stream all your music (iOS or otherwise), including pricier ones like the impressive Astell and Kern’s XB10 and highly affordable ones like the $20 Jumbl. However, none of those adapters allow for multiroom streaming, and even without that feature, the Chromecast Audio is still a fantastic choice among the crowd for its functionality and affordability. Yes, but assess your options first. If you’re looking to stream music to your home theater system wirelessly, the original Chromecast works great and brings all of its video streaming features along for the ride. However, if you’re looking for an easy and convenient way to connect a powered speaker or home theater system without a the need for a TV or HDMI connection — or if you want to connect a number of speakers in a multiroom setup — the Chromecast Audio is an excellent way to go.